One of the questions I am most frequently asked by other photographers, and even non-photographers, is how do I get the eyes in my portrait images to “pop” so much … if I’ve done my job correctly, they are in crisp focus, full of light, life and just draw you in. Like many things in photography getting beautiful and crisp eyes that “pop” is like a puzzle. 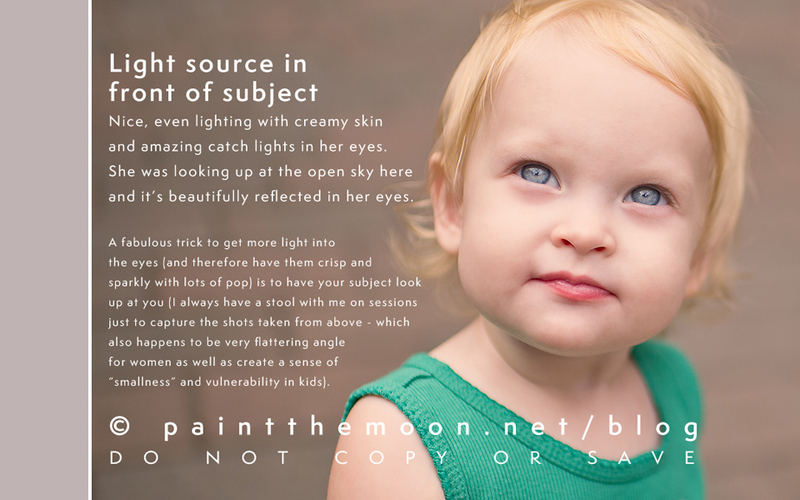 And because there are so many contributing factors to getting that WOW factor, I’m going to break this into a two part series with the first part focusing on finding the light (not just for great eyes, but for beautiful skin tones, an even exposure, and many other benefits that can make or break a photo as well). In the upcoming parts of the series I will focus on, well, focus – as well as Photoshop techniques to really take your portraits to another level, specific lighting situations and tips and more. Nailing your focus while shooting portraits as well as knowing how to properly edit them is of the utmost importance in getting crisp, clean eyes that just reach out and call to the viewer. Getting all that glorious light into the eyes won’t help much if they aren’t sharp. We’ll also cover using Photoshop actions like Sparkle Eyes to help make eyes sparkle and pop even more. The number one thing you need to get eyes that wow is LIGHT. I know, you thought I was going to say Paint the Moon eye actions, right? Well, that is part of the equation, but that will come second. Finding light is the first step to making eyes pop. Lighting isn’t just important in making eyes pop, but in every aspect of photography. It’s an essential piece of the puzzle and one you should strive to master. 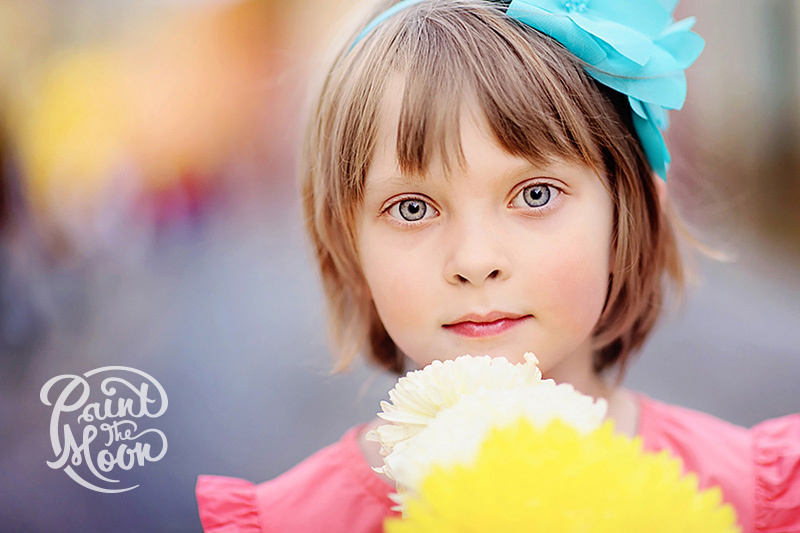 After capturing those beautiful peepers you’ll move on to enhancing the light and sparkle in editing. There are a number of ways to go about this, and a number of ways to search for that perfect light and know when you’ve found it. Note: this image was taken just as the sun was going down with the subject looking in the direction of the sunset – obviously not recommended for a number of reasons during mid-day sun … but here it just lit up her eyes and cast a warm, even light over her face. The important word here is *open* shade … you still want your subject to be facing the light source and usually the closer to the edge of that open shade (at the edge of a forested area, under the shade of an awning, just inside a doorway, under a tree, etc) the better. I’ve found when shooting in urban locations you can find amazing light by having your subject in the open shade of a tall building … in front of them lots of open sky and light to reflect into their eyes, they are benefiting from those reflections and catchlights they create while they are staying out of harsh direct light. The prettiest catchlights in open shade will be captured in a location where the main light source is coming from one direction and your subject is facing that light while just inside the shade (think of an alley way, just inside a doorway, etc.). 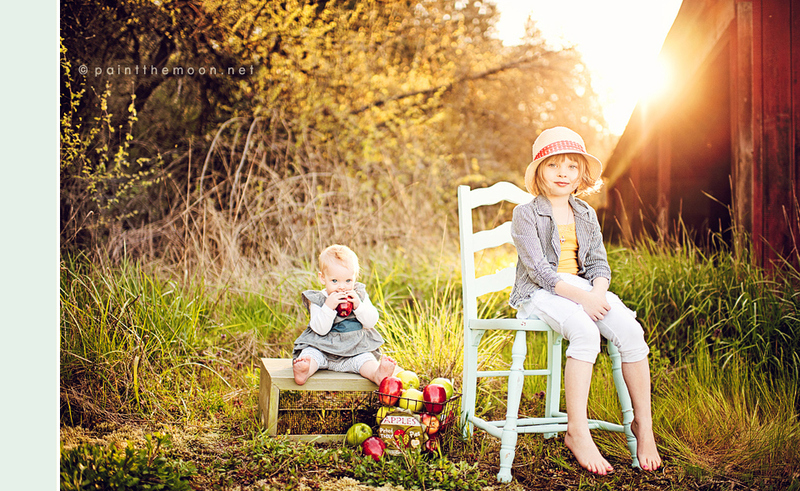 Here is an example of an image taken during the golden hour in open shade (under a canopy of cherry trees). And another example taken on the sidewalk downtown, just at the edge of open shade under an awning. I adjusted my settings to properly expose her face in each example here – both back lit and side lit images were still a bit underexposed on parts of her face, but I didn’t want to risk blowing out the highlights on her face. And here is another taken in open shade at around an hour before sunset (the golden hour) – she is sitting on an open deck with a building behind her and shaded by a wall from direct sun, however, the sky is open above her and wide open sky in front of her. This creates a beautiful, even light across her face, creamy skin and eyes that sparkle. And, yes, this works with all subjects! 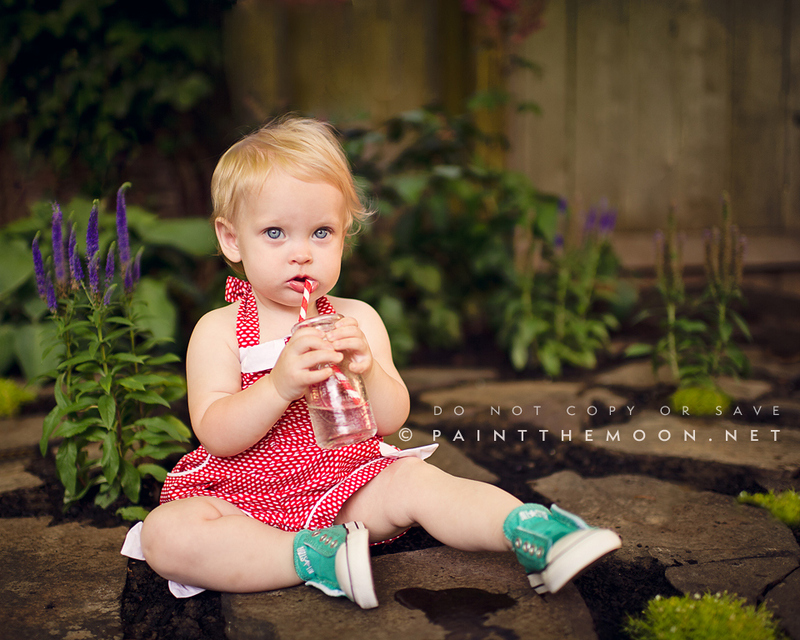 Here is cute little Pumpkin … we were in an open shade area at golden hour. The direct sun was shielded by buildings on either side of us, but open sky was all around us as you can see reflected in her pretty eyes! Place your subject in front of a window or an open doorway and watch how the light falls on their face and in their eyes. Window light can be phenomenal. It’s actually usually best to not have them face the window or light source indoors head on, but rather close to a 45 degree angle to avoid washing out the face. Have the face angled just a bit from the window or light source can add some dimension and depth to the portrait. Here is a good example of pretty window light – taken at about a 45 degree angle to a north facing window. The biggest aid you can use is just using your own eyes to watch the light in the eyes of your subject. 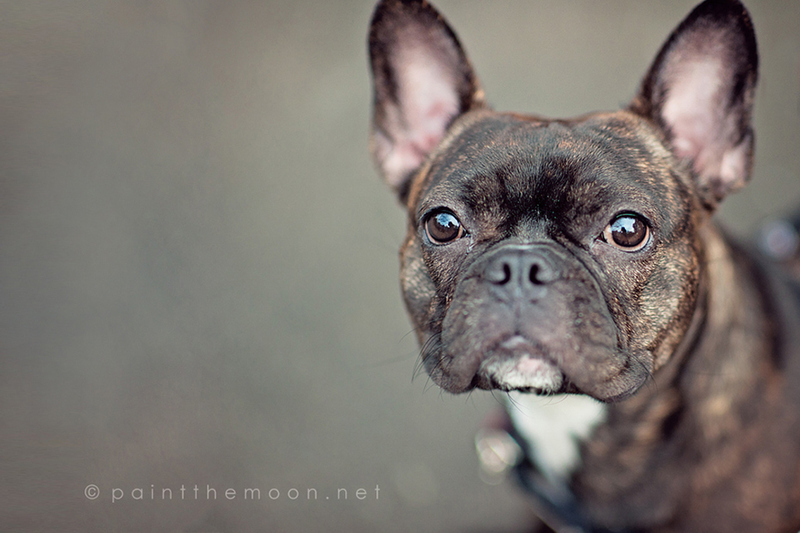 The catchlights (the reflection of the light source in the eye) add depth and life your subject. I often have a subject stand here or there, then have them slowly turn around as I continually watch the catch lights (or lack of) that are falling in their eyes. You’ll know it when you see it. Not only does finding that perfect light help the eyes – it helps the whole image with better skin tones, better exposure and less harsh shadows and highlights when the whole face is lit properly. Note in the example below how turning my subject dramatically changed my light and not only how her eyes sparkled and lit up in the position I would have placed a subject in (facing our light and open sky), but also note the fall of the shadows and highlights and the color casts introduced when she wasn’t properly lit. Also note that she was in the same exact spot for all three of these photos save a foot or so to move out from the wall in the back lit example. Look for the light first! Some photographers might have assessed our location and seen the pretty green landscape behind her here in the first image (there is even a gorgeous river behind her), and just started snapping. However, this is about the worst position for her to be in because the light is behind her (and not a pretty, sun flare back light that I often seek out), and worse, directly in front of her was a building that blocked any chance of a reflection from the sky in her eyes. 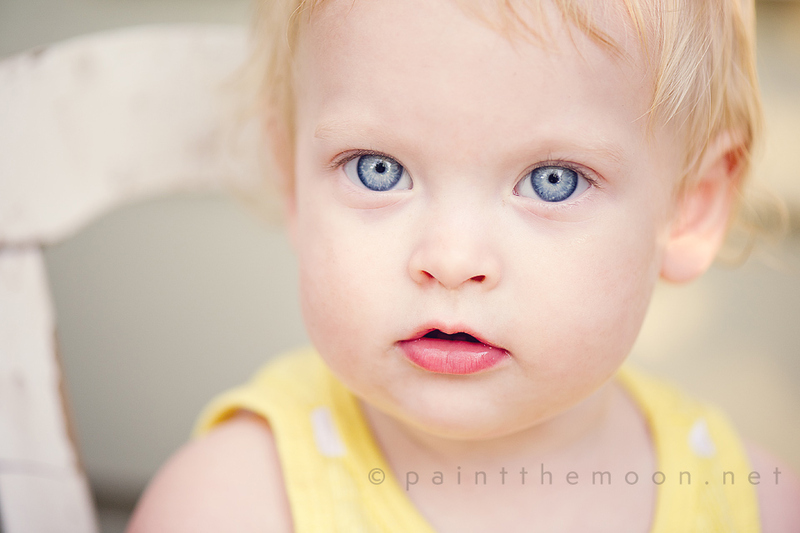 Notice the lack of light in her eyes, the harsh shadows and highlights which create a mottled light on her skin, and the uneven color in the skin (for instance the yellow cast under her right eye). Simply placing a reflector in front of the subject to bounce that light back on her could have helped if turning her towards the open sky was not an option (for instance, if you just had to have a shot with something in particular as a background or the spot where the light was good had too much clutter, etc.). See below for more on reflectors and other aids. This is unedited … post processing work could help it quite a bit, but working with a properly lit image to begin with makes your final results so much better and editing so much more fun (see final image when properly lit AND edited for the fabulous possibilities)! Next I simply had her turn at a 45 degree angle to the open sky/light. Besides the oh so joyful expression she gives me, also notice the darkly shadowed right side of her face and bright highlight on left. This look can be desirable as long as you have enough light in the shadowed side, especially in the eyes. It can give a very dramatic look, and looks particularly lovely and moody with a nice black and white conversion. This is straight out of camera, no editing was done. And here is the same side lit image with a touch of editing from the Picture Perfect set just to open up those darker shadows and brighten a bit. And finally, the shot I would have gone for from the start … facing that open sky that is lighting up her face and reflecting in her eyes, making them pop. Gorgeous, even lighting … no harsh shadows, lovely even skin tones, eyes that sparkle and light up. Yummy light! Now when I edit this it will add an extra wow factor and make the image really shine. NOTE: Sometimes head on front light, shining on the subject with no angle at all to the light source, can create a flat look with no dimension in the shadows or facial features … if you find this to be the case, have your subject angle themselves just slightly to get back some of that dimension and interest. And the final edited image (a 30 second edit using Perfect Portrait from Picture Perfect Mega Set and Wham Bam from Fresh Wonderland). As noted above, sometimes having the light source directly in front (as in, head on) of your subject can sometimes leave you with a flat look … this could have been just a bit improved if I had her angle her head just a bit in order to bring a little dimension back to her features. I also happen to use a little trick that I learned many years ago … marbles. I carry a handful of marbles in my camera bag at all times. Sometimes you want to set up a location with props and such before the client arrives and you need to be sure you are in the ideal spot for the lighting at hand. Or sometimes you have tiny people that simply will not stand still and will definitely not be willing to patiently turn in a slow circle for you while you look deeply into their eyes searching for the perfect light to hit them. That is when I pull out my marbles. 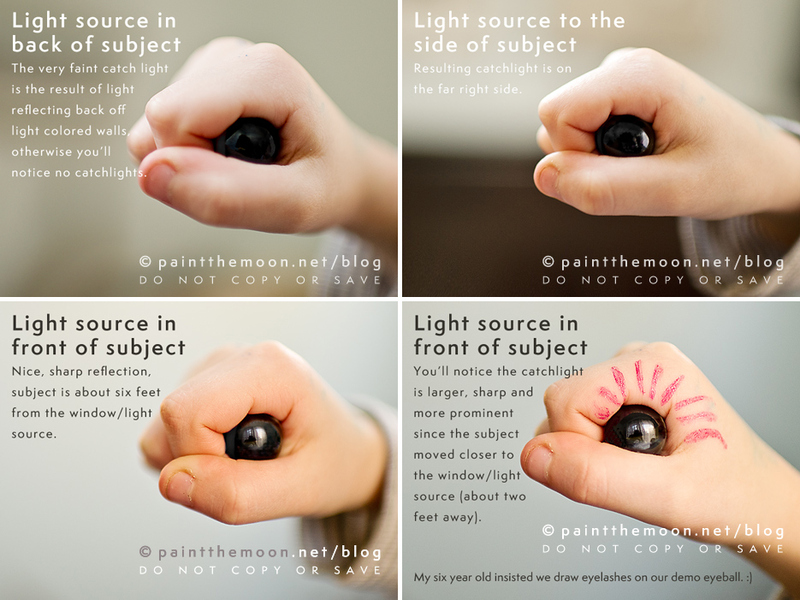 I place one inside my fist as shown in the photos and then just act like that is my subject’s eye – closely watching how the light is reflecting as I turn around as a subject would. Be careful to push the marble back into your fist enough so that it mimics the hood of an eyelid that will shade the eye from light somewhat (in the last image my daughter let the marble slide out a bit too much). This works wonders! Plus kids adore being able to have the special task of then keeping that “magical marble” safe until the end of the session for me. Having been a photographer that is obsessed with getting eyes to pop for so long this is something I notice immediately no matter what the situation. My eye is constantly assessing the lighting situation and watching catchlights in people’s eyes now. I’ve even got my husband and daughter doing it now … “Mommy, isn’t the lighting here perfect for photos?” … “Look at that warm sun glowing – that would make awesome sun flare shots.” or, “Wow, the catchlights in your eyes are amazing right now.” LOL! Well, not you … but have your subject look up towards you so the open sky reflects in their eyes. If I’m struggling to get a good catchlight in the eyes many times I’ll stand up higher than the subject (either by standing on chair, stairs, etc) or by having them sit down and hovering over them. Having them look up towards me lets the open sky reflect in the eyes and can create beautiful light in the eyes. I love shots where you can see the sky and people standing over the subject. In this one here when you zoom way in you can make out the blue sky, clouds, me with my camera and her mom peeking over my shoulder watching! And here is a comparison showing the subject in an overcast sky situation. You can see the very dramatic difference simply turning her around (she’s in the exact same spot for both images), and then having her look up towards me just a bit for even more oomph in the eyes. In the first example she is under an overcast sky and about 40 feet from us is the edge of a large forested area … so while we are in the open, softened light of the sky, the sky above her is blocked and there is nothing to reflect any light back on her face and in her eyes. Instead the main light comes from behind and directly overhead, causing raccoon eyes that are hollowed out with no catchlights reflecting back and causing harsh shadows and too bright highlights on her face and hair. These problems are usually most apprent in bright overhead sunny conditions, but if your subject isn’t in the right position it can happen even on overcast days. Always watch your light! Now here I just turned her around, so now the open sky is in front of her and the wooded area behind. You can see the nice, even lighting with creamy skin and amazing catch lights in her eyes. She was looking up at me towards the open sky and it’s beautifully reflected in her eyes. Don’t blow it – grab that golden light! If you’re not shooting in shade – or even if you are, for the best results, shoot at the right time of day … the golden hour (an hour after sunrise or an hour before sunset). Don’t shoot in the middle of the day in harsh sunlight where shadows and blown out (too bright) highlights are likely to occur (as are squinty eyes). The golden hour is coveted by photographers for the yummy light that is soft and low in the sky. It’s just a heavenly time to be shooting and I normally plan my shoots at that time at all costs. Which ever time you end up shooting, always be on the lookout for harsh shadows and bright spots that are landing on your subjects – those can make or break a photo. If you are shooting on an overcast day the sky can act like a giant soft box, but you still need to be aware of where the main light source/reflection is coming from. Sometimes those overcast days can cause raccoon eyes with no light in them if you have your subject in the wrong position (see the image above of the babe in green). Learning to immediately find the light when you enter a new location or lighting situation is something that will take time and practice. 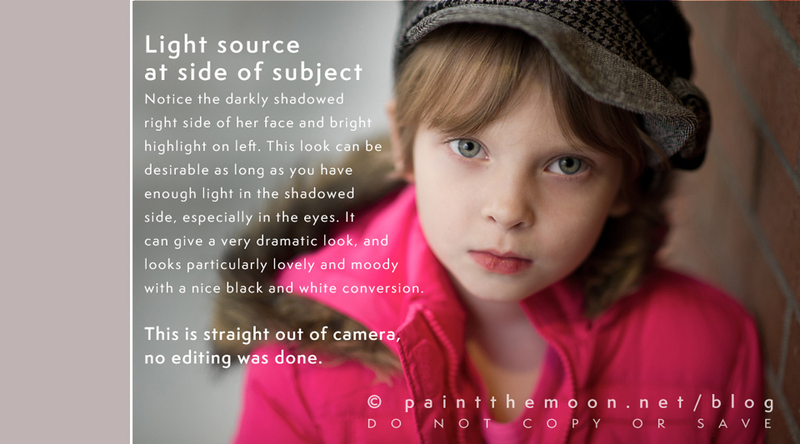 Try taking willing subjects out to do some tests of your own as you shoot in different lighting situations, angles and locations – then examine your results by looking at the light in the eyes, shadows that are cast, highlights that may be too bright, etc. Here is one more example … subject is sitting indoors in the same spot, only turning around to face a different direction with each image as noted, all three unedited. 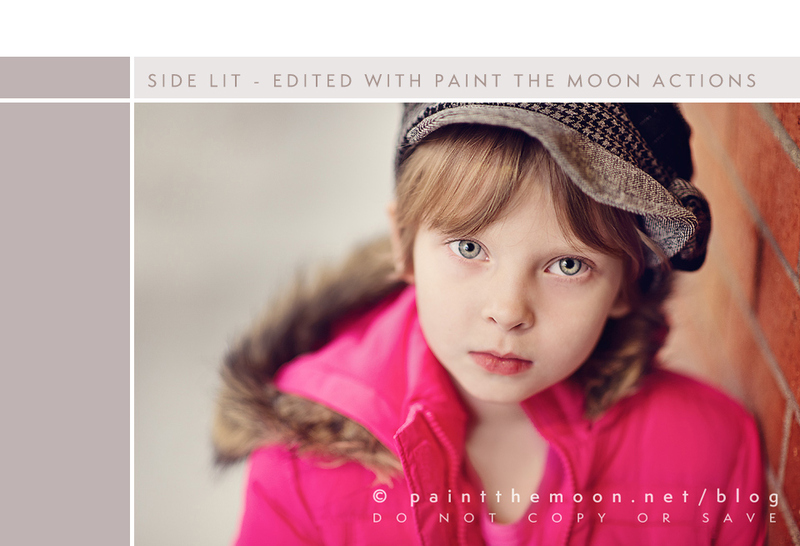 And here is the third, front lit image with a quick edit using Paint the Moon’s Fresh Wonderland 2 set and Picture Perfect. Try using a reflector to bounce light back into the eyes and face. This isn’t something I normally do because I shoot kids, babies and families and running after little ones is challenging enough already without having to fight with a reflector to bounce light as well. This can be used very effectively, however, with adult subjects and even better if you have an assistant to help. Again, just watch the light as you change the angle of the reflector until you see that light bouncing into the eyes. Reflectors can be especially handy when you are shooting backlit images in order to capture that yummy sun flare while keeping your subject well lit and their eyes full of crisp light. One more trick I’ve learned over the years is to wear a white shirt that will act as a natural reflector … you can tell how busy I’ve been with sessions by the number of white shirts in the laundry that week! Side note: also be wary of what color you are wearing if you are not a white shirt lover – those colors will reflect back on your subject and leave you with a nasty red/blue/etc. color cast to deal with! Other objects or surroundings can act as handy reflectors as well … sidewalks, light and neutral colored walls, etc. Oh, and bodies of water are incredible bouncers of light – this last image below was taken during the golden hour with the ocean surrounding us *and* the soft, warm sun was also reflecting off the light colored balcony we were on. Don’t use a flash if you don’t have to … try a reflector first, or if you must use a flash either bounce it or soften it with a softbox and get it off camera if possible … so you don’t end up with telltale pin lights in the middle of the eye and a flat, washed out look. Your camera’s on camera flash is the worst offender – if you find yourself needing to use flash, invest in an external flash and diffuser. There are amazing photographers out there that can rock the off camera flash and make it look beautiful, natural and artistic, if you are one of those people then kudos to you … if you are not, I would suggest trying to find a way around using flash, especially on camera flash. I prefer to do whatever possible to find that glorious natural light and don’t even own a flash for my camera. 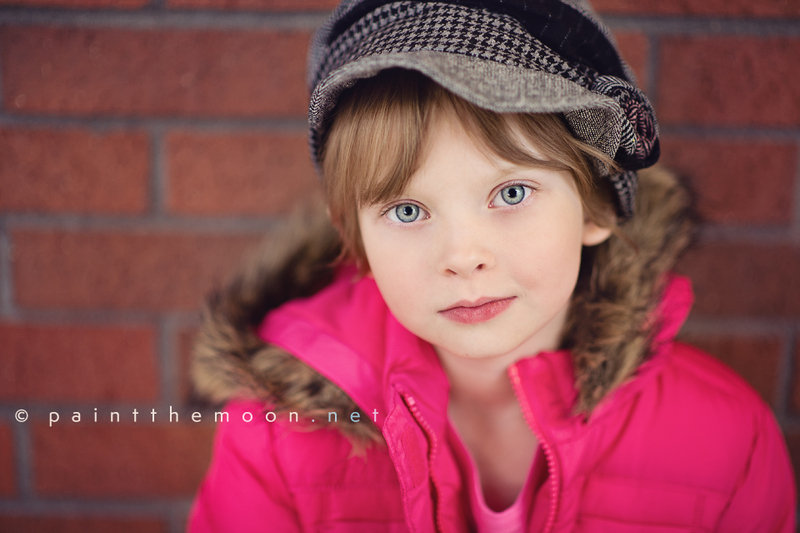 Sometimes it can be done by simply moving my subject, using some sort of light reflector or trying a different angle. Look for the upcoming parts of this series soon where I’ll delve into more specifics on how to manipulate the light you have available, the specifics on working with each type of lighting (including specifics on indoor lighting situations and taking back lit images with sunflare), how to nail your focus to get crisp eyes that pop and also talk a bit more about how depth of field can enhance the look of sharp eyes, and much more! There are so many points to cover I didn’t want to overwhelm anyone by dumping all the information and examples at once! I hope you found this helpful and appreciate your sharing the link with others if you found it valuable! I adore your work. what an incredibly helpful post! Thank you for this post! I can’t wait to read the next one! The “sparkling eye” blog was so helpful! Thank you! Your work is amazing, and your girls are BEAUTIFUL!! Keep ’em coming! Oh my, what a great post! This is the first post I’ve read on your blog so I don’t know how much detail you normally put into your posts but I know this one was a lot of work to put together. Great job. Love the tutorial! I read all of your stuff and learn so much! Thanks and Lord Bless! Thank you so much, Annie! My cinematography professors at school always discourage us from using natural light but this post just encourages me even more to make sunlight work. This was so helpful! Amazing, Annie! Thank you SO MUCH for taking the time to do this! WOW! GREAT Stuff! Thank you for sharing your knowledge. You’re incredible! Fantastic article!! Thanks you so much!!! This is a GREAT tutroial. Thanks so much!!! Wonderful post! I can’t wait for part 2. Thank you! Loved all the examples! 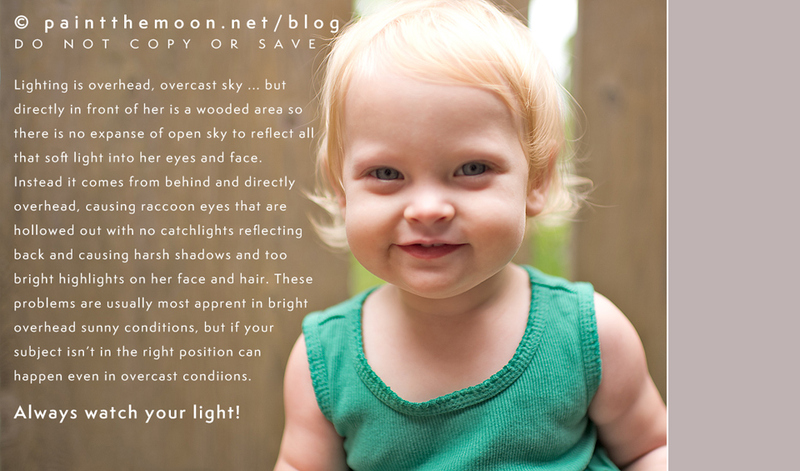 Annie, This one of the best (easiest to understand) explanations of using light that I have read. Thanks for sharing. This post is great!!! I am a new photographer and can’t wait for part two (nailing focus)! Thank you!! So inspiring and so clearly articulated. Thank you!!! LOVE LOVE LOVE! As always Annie you never disappoint. Very useful! I adore your work. Thank you for your helpful article. I can’t wait to keep reading. I absolutely love the way you go into detail with several examples. It is so helpful, concise and clear. In a time when so many photographers are secretive you open your heart and your giant brain full of knowledge and that is a character trait I can respect and appreciate. Thank you do much Annie! You explain each step so clearly it’s easy to follow along. I’m wishing I had stock in marbles and white t-shirts after reading this because I’m sure sales are going to soar! Love this!!! Thank you. 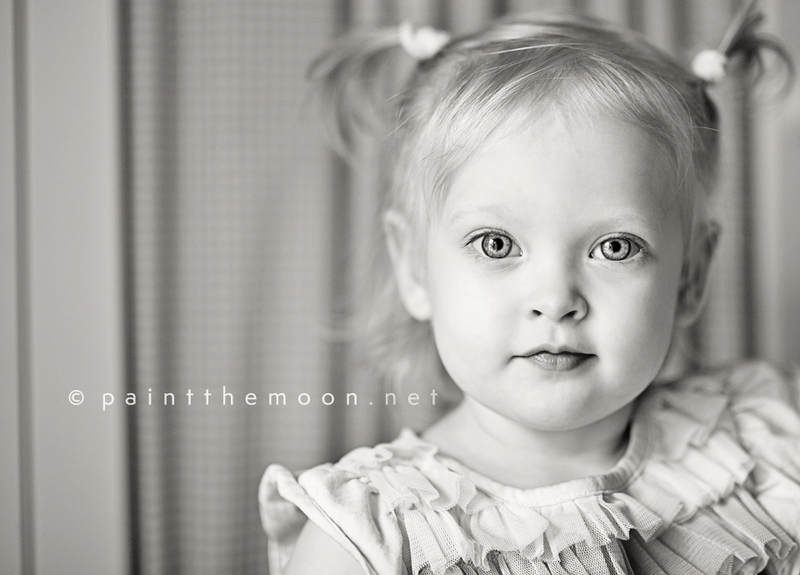 But I have a question….what is the trick to keeping your subjects from squinting? It seems I am always keeping them AWAY from the sunlight (having it at their back) because otherwise they are squinting. Even in the golden hour, as the sun goes down, it’s shining directly in their eyes. thank you sooo much for that!! i want to get the eyes in my photos like that! this was helpful! Thank you so much for the great information! Very, very helpful! Thank you for sharing your talent with us!!! What a great tutorial! I really appreciate the examples, and your girls are such cute models. Thanks for taking the time to share these images. Love the examples, we visual peeps need that!!!!! Thanks so much Annie for working so hard to put this together, can’t wait for the second post! I’m looking forward to the second part. Wow!!! Thanks for this great tutorial with the great images to understand it! Thanks so much Annie – wonderful article. I immediately grabbed my son and said “come on, Mommy needs to borrow your eyes LOL” he said “huh?” thanks for sharing your knowledge with us. Can’t wait for the next post. awesome tips – you rock! really, write a book, you give absolutely fantastic advise!!!! Wonderful post, Annie! Thank you so much for sharing your experience and expertise with us. I love learning from others…and will definitely be more aware during my next shoot. I’m looking forward to your next post!! Hope it doesn’t crash the site! Ha,ha. Very well explained with photos! thank you so much for all your tips. I love your site. I have never really followed blogs before, but i find myself keeping up with yours! I love all the info you put on your site! Thank you for all the time and effert you put into it! What a great post! I love the marble idea!! Brilliant. And thank you for showing such great examples of front/back/side lighting. This makes me want to really practice and nail it! Thanks! 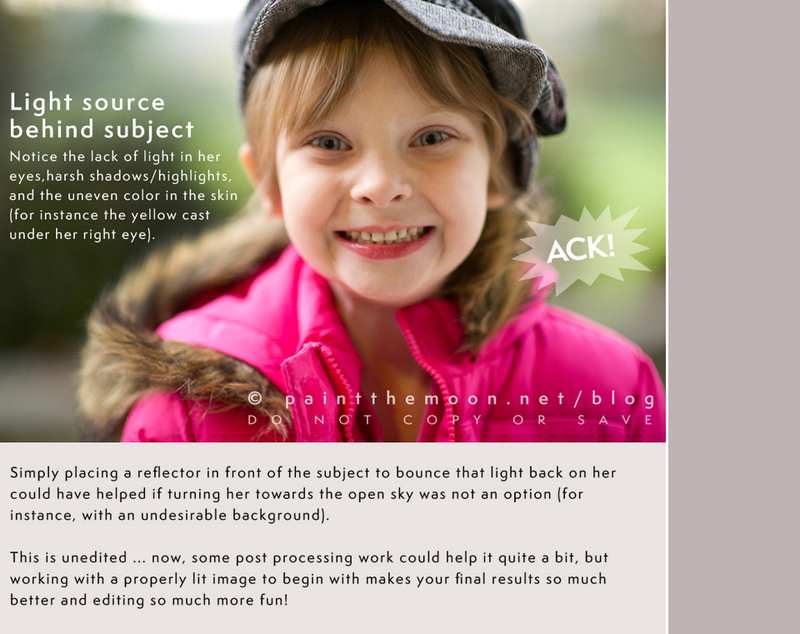 Thank you so much for such an awesome post on utilising light to enhance your subject’s eyes. I’ve been dying to read it but haven’t been able to find it.. but it was worth the wait! You’ve inspired me. I can’t wait to read the next part! You are so kind Annie to take the time to help out photographers like myself who want to learn all we can! I LOVED this post and bookmarked it so I can come back from time to time and re-read it. You have so many great tips I want to try and I can’t wait for your Part II. thank you, thank you, thank you for sharing the knowledge you’ve worked so hard to gain! can’t WAIT to read part 2!! Thankyou for that wonderful tutorial! Wow, thank you so much for the amazing tips, that was fascinating. I’m intrigued by the white shirt tip…dont you end up with it completely stained after rolling around on the ground capturing children? Wow! Thank you so much for the time you put into this! Photography is my hobby and I’ve had some friends ask if I’d take their family pics. I am so nervous about messing them up. I usually have a lot of grainy noise in my images (I don’t have an awesome camera that can handle high ISO). Anyway, I am so looking forward to Part 2! amazing posts! thanks for your talents and generosity! I LOVE the marble tip! I can’t wait to go buy some and bring them to my sessions. I’m ready for Part 2. Thanks so much!! This is so amazing! I cannot tell you how much I’ve learned just from this one post! Thank you so much for sharing and helping me improve on my passion 🙂 Can’t wait for more! thanks so much. love your stuff!!!! what a wonderful tutorial. Thank you for the time you spent writing, creating and digging up photos as examples. As always your blog and your photos are beautiful. Thank you so much for sharing! This is so inspirational, your photos are amazing and the eyes just grab you!! Time to go practice! What a wonderful post!! 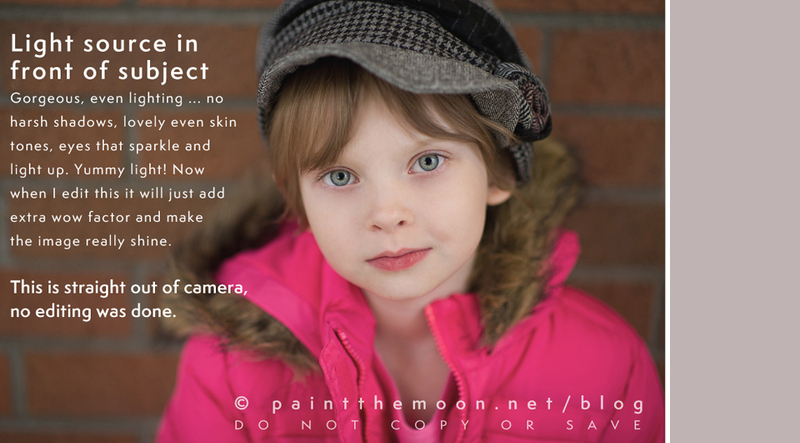 It is so refreshing to read a blog where the “secrets” of good photography are openly shared! I am always stumped when pro photographers are so tightly guarded with their tips and tricks!! Thank you again! THANK YOU! Loved this tutorial! Love the actions I’ve seen so far! by far – my greatest weakness and need for learning is how to truly edit my photos with photoshop. but I also love the reminders on truly capturing a great shot from the beginning. thanks! makes me want to grab my camera and force my kids to experiment with me today! 🙂 Oh – and the eyes have always been what has captivated me in photos – more than anything – more than artsy compositions, etc. I love seeing people’s eyes – crisp, clear and telling a story. It was delayed, but will still be published in the next couple months. 🙂 Please check back … if you sign up for the newsletter you’ll hear about special new articles when they are posted. Thanks! By FAR the best tutorial I’ve ever seen on photography. 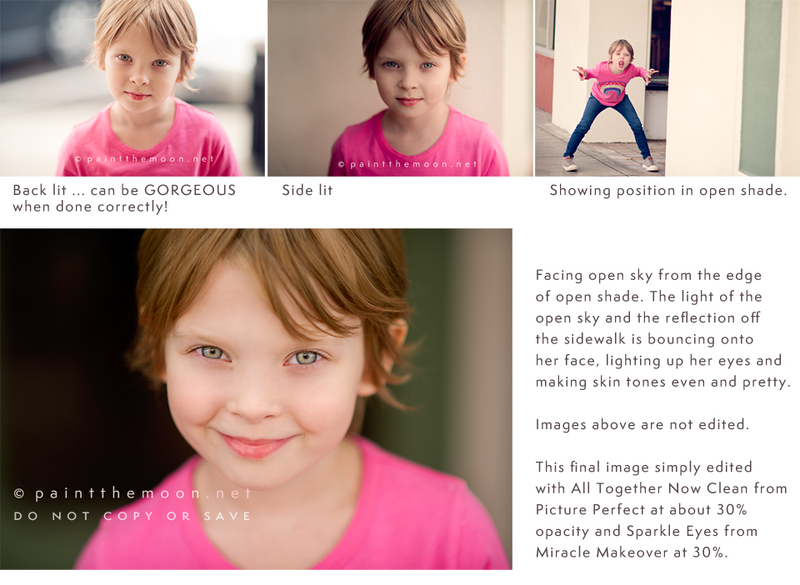 Annie, this tutorial changed the way I shoot, period. Thank you for putting this together! I would love part 2 of this. Great post Annie! Lots of useful tips in here for beginner and advanced photogs! Well done!! Wauw 🙂 thanks a lot for this great information! 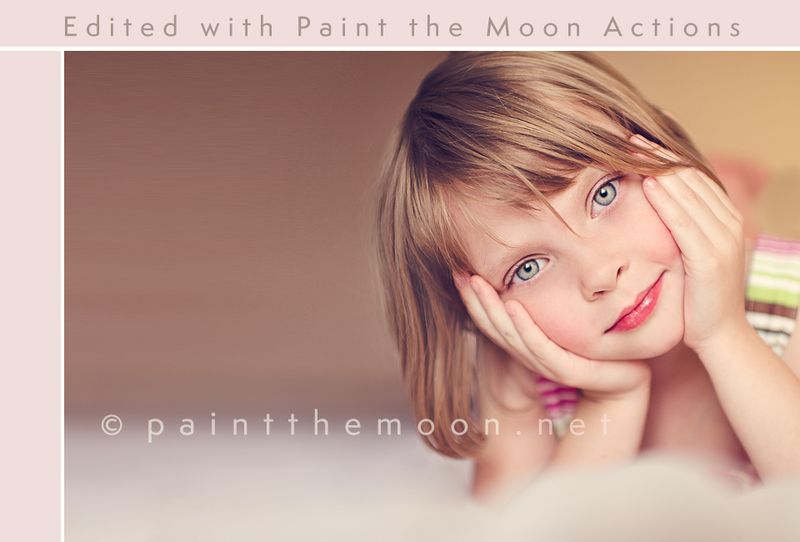 Some great tips and beautiful portraits Annie – I really like the marble idea. Thanks for sharing! Wow! This is the most helpful tutorial I’ve come across! Thanks so much for sharing – especially the magic marble! Genius!